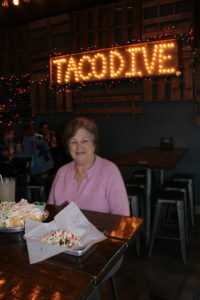 Taco Dive Was a Hit! Taco Dive, is not a dive at all. Great meals and beverages!! American Press Travel News–12/15/18–at Taco Dive-Port St Lucie, FL–Bob & Barb “On The Road Again.” Great, really great taco’s and burritos are hard to find. Well, this place was no dive, it was a hit with us, and as we noticed many others in the area known as Tradition Square.